You are currently browsing the tag archive for the ‘Marijuana in Maine’ tag. Terrence Sawtelle, who ran downtown Bangor pot-smoking lounge gets year and a day in federal prison! 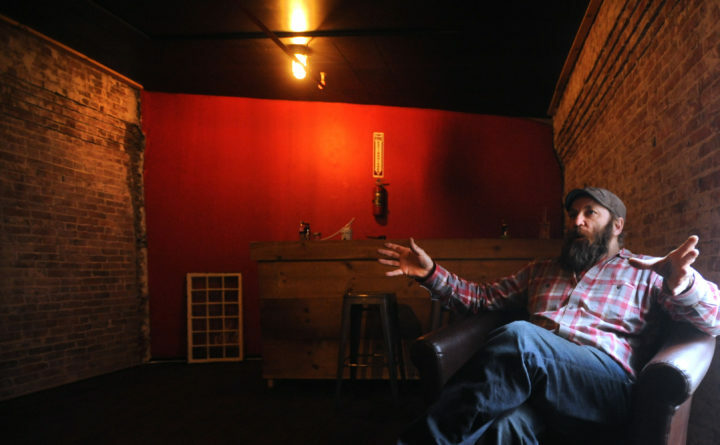 Christopher Ruhlin, owner of Herbal Tea and Tobacco, is shown in the smoking parlor of the Bangor shop. The man who ran a downtown Bangor smoking lounge for medical marijuana users was sentenced Tuesday in U.S. District Court to a year and a day in federal prison. Terrence Sawtelle admitted to conspiring with Christopher Ruhlin, the owner of Herbal Tea & Tobacco, to illegally sell marijuana from a dispensary that was not licensed by the state. Sawtelle rented space from Ruhlin and operated 13 Owl’s Club as a hookah lounge for about two years beginning in 2014, according to court documents. Herbal Tea & Tobacco still operates at 44 Main St. and on Hogan Road in Bangor. The smoking lounge is closed. Sawtelle, 49, of Bangor and Ruhlin, 49, of Holden pleaded guilty last year to drug conspiracy charges. Ruhlin also pleaded guilty to one count of structuring, or trying to hide cash deposits from bank regulators. Ruhlin is to be sentenced Tuesday afternoon in federal court in Bangor. U.S. District Judge Jon Levy said at Sawtelle’s sentencing that the pair not only broke federal law but also did not abide by Maine’s medical marijuana statutes. The rules allow medical marijuana caregivers to grow pot for five people who have the proper paperwork. Ruhlin and Sawtelle had four patients on the books but used the fifth position as a “floater,” court documents said. The fifth person came to the lounge, immediately became a patient, but once the person left, he or she was no longer considered a patient, and another customer would become the fifth patient. The pair did not sell marijuana to people who did not have medical marijuana cards but the business was not licensed as a dispensary, according to court documents. In July and August 2016, an undercover confidential informant made three separate purchases of marijuana without the proper paperwork. At his sentencing, Sawtelle said he was “deeply remorseful” for his actions. “My foolishness was trusting someone who was not an attorney about the legalities” of dispensing medical marijuana, he told the judge. Sawtelle’s attorney, Charles Hodsdon of Bangor, described his client as a “true believer in the medicinal value of marijuana.” He said that Sawtelle and Ruhlin were lifelong friends when the two decided to open the smoking lounge. Sawtelle purchased marijuana from Ruhlin and other illegal suppliers. Levy said that an average of a quarter pound of pot per day was sold from the smoking lounge. When the 13 Owl’s Club was raided in August 2016, three pounds of processed marijuana was seized, the judge said Tuesday. Under federal sentencing guidelines, Sawtelle faced between 18 and 24 months in federal prison. Assistant U.S. Attorney Joel Casey recommended Sawtelle be sentenced to 18 months in prison. Hodsdon urged the judge to impose a sentence of probation and community service. In addition to prison time, Levy sentenced Sawtelle to three years of supervised release. By sentencing Sawtelle to a year and a day, he will be able to earn time off his sentence for good behavior. The judge ordered Sawtelle to report to prison March 14. Three other men who grew marijuana for Ruhlin in Frankfort were sentenced in the case last year after pleading guilty to drug conspiracy charges. Nicholas Reynolds, 34, of Bangor is serving a six-month sentence to be followed by three years of supervised release. The first six months of his supervised release must be spent in home confinement. He is incarcerated at the federal correctional institute in Berlin, New Hampshire, and is due to be released April 22. Jeremy Duguay, 35, of Bangor was sentenced last year to two years of probation for his limited role in the operation. Reynolds and James Mansfield operated an indoor pot farm in a Frankfort warehouse that produced between 5 and 6 pounds of marijuana per month that was sold through the smoking lounge. Mansfield, 34, of Etna was sentenced last June to a year and a day in prison for his role in the conspiracy. He is incarcerated at a federal facility in Devens, Massachusetts. He is due to be released June 21. Reynolds and Mansfield grew marijuana at the Frankfort warehouse — a larger, sophisticated indoor grow facility — from October 2010 to August 2016. The warehouse was leased to Ruhlin between December 2010 and November 2013. Ruhlin left the conspiracy in 2014, but sold marijuana grown there by others between May 2014 and Aug. 25, 2016, according to court documents. In May 2016, law enforcement officers executed a federal search warrant at the facility and recovered about 400 marijuana plants, 295 marijuana root balls, and paraphernalia used to manufacture and process marijuana. The operation would have been illegal under state laws governing medical marijuana. The maximum sentence on the drug conspiracy charge is 20 years and a fine of up to $1 million.